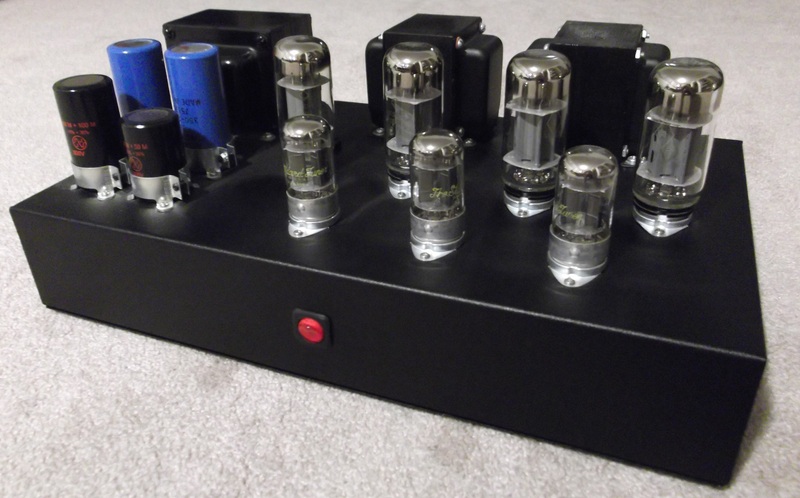 This was the second amplifier I built for myself and was completed in September 2006. It uses a power transformer scavenged from a Fisher 400 Receiver and Hammond 1645 output transformers, and produces 25 watts per channel. It was originally planned for the Fisher 400’s output transformers, but one turned out to be failed. Because the Hammond transformers have tapped primaries for distributed load operation, the output was rearranged for this topology. The input and driver stages are almost the same as the 6V6 push-pull previously posted because the former was based on this design, which is itself based on designs used in Pilot models AA-410, AA-902, AA-902A, and others. All tubes in this amplifier are of course re-selected to suit the builder’s tastes. Soviet-era 5881s and loktal-based 7N7s branded “Standard Tuner” bring the music. I do use a lot of loktals, because I claimed my stash before they got popular. This schematic looks a lot like the 6V6 push-pull amplifier, but is just bigger and more powerful. The power supply mirrors that of the Fisher 400 receiver, as that was the source for the power transformer. Heavy capacitive filtering eliminated the need for a series choke, and the output is hum-free. The completed amplifier has a powerful, clean sound which is unlike the Fisher receivers, the Dynaco amplifiers, and others I have heard using split-load phase inverters. This may be because those items did not use the magic combination of all-triode operation and distributed load topology. This sort of design is very easy to lay out and wire, and gets excellent results.